In 2012, New York Life Insurance’s social media guru, Dipayan Gupta, used social media to reach out to policy holders, after the deadly and destructive Hurricane Sandy. Gupta informed all of their policy holders that if their home was damaged during the storm, they could reach out to New York Life via social media. Let’s analyze this, for a second. New York Life, one of the biggest insurance companies in the country, employs someone whose main priorities revolve around social media. Not only are companies hiring social media savvy people to run their accounts, but they are using the social media to connect with their customers, clients and partners about their business. If New York Life was your provider during Sandy, you could reach out to them via social media. That was a huge step, and victory for social media in the modern business world. 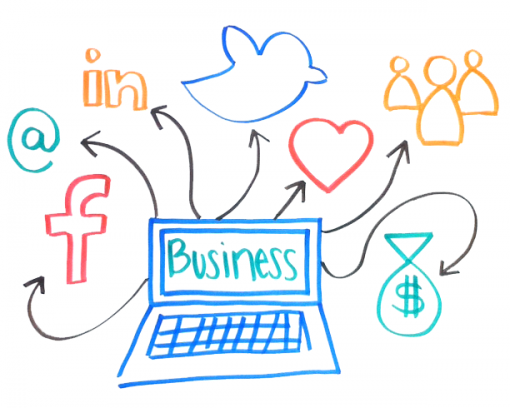 One of the things to think about, is how many companies are actually using social media. The truth of the matter is that while many businesses and executives use this powerful tool, not everyone is on it. There are many companies whose target demographic don’t use social media, and therefore avoid investing the time that it takes to develop a strong social media presence. One of the first things that will happen, though, is that nearly every company will decide that it’s a good idea to use social media. It’s a great marketing tool that is either free, or cheap to use. Other than marketing, it helps you interact with you customers and clients via instant messaging, video chat, etc. and it will help you get a better feel of what your audience wants to see. Judging the amount of traffic that websites like Facebook, Twitter, and Google + have been getting, we will probably see companies promote their social media pages more so than their websites. It’s possible that we even see their social media pages completely replace their old websites. It could end up saving companies a lot of money by not having to pay a web designer or to keep their web domain, too. One of the major issues that we could see, is a lack of marketing expertise that social media authorities have. Companies will have to search for someone who is well versed in the worlds of marketing and social networking, in order to maximize their use of social media. Marketing experts can help turn buzz into cash flow, while someone who only knows about social media normally hasn’t learned how to do so. Digital marketing companies are becoming prominent, and are all emphasizing the importance of social media. Social media analytics along with big data analytics is a new up an coming industry that is bringing a lot of value to the marketing table. NUVI out of Utah is a prime example of how important this aspect of business is. In the near future, we could see companies choose to turn their social media focus to just one or two platforms, instead of taking the time to build a fan page or profile on every single site. Facebook, for example, draws in approximately 750,000,000 unique monthly visitors, while a similar site, Orkut, attracts a much smaller audience of 17,500,000 unique visitors. Businesses may not want to spend time creating on the sites that generate less traffic. Ten years ago nobody was really using social media. It wasn’t relevant in business or our lives. It’s amazing to see how far it’s come now, and it’s fun to think about what the future has in store.